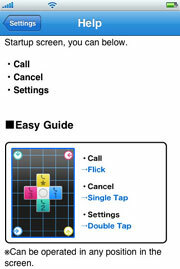 FlickCall is an application that can make phone calls quickly flick. 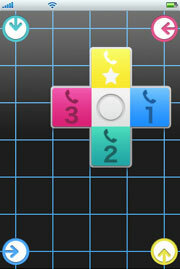 Phone set to flick the phone number of vertical and horizontal directions. Very simple, Quick, and your eyes Please use the iPhone if you want to call off the screen. 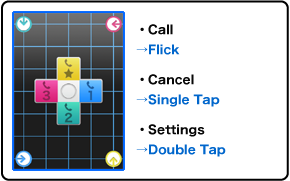 FlickCall comes in two versions. Startup screen, you can below. ※Can be operated in any position in the screen. 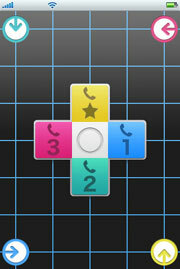 If you flick to the left, right, up and down, you can call the phone number key that corresponds to that direction. After the flick, about to make a phone call between a 1.5-second wait time is set, you can cancel. 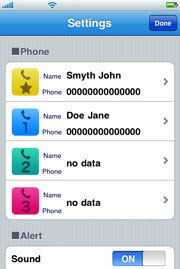 iPhone "Contacts" to use the registered phone number.